Links to short articles answering each question about why and how to have no rich and no poor, a.k.a. egalitarianism, are provided below; the articles are written by myself. Q 1. Why is it important to have no rich and no poor, a.k.a. egalitarianism? https://www.pdrboston.org/why-no-rich-no-poor . Also two videos: "Why Physicians and Janitors Should Be Equally Wealthy" at https://www.youtube.com/watch?v=aATTR1Dsa80 and "Why Abolish the Use of Money" at https://www.youtube.com/watch?v=xcyx_eveZ5Q . NOTE! Egalitarianism does NOT mean everybody is identical: read "What 'Equality' Does NOT Mean" at https://www.pdrboston.org/what-equality-does-not-mean . 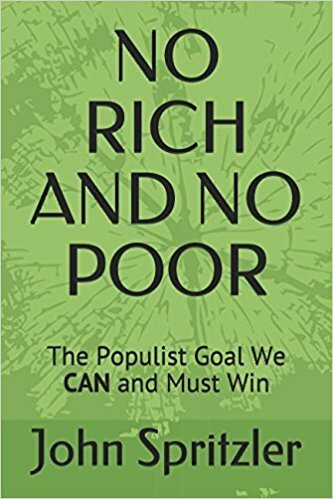 Also note: being rich does not make somebody the enemy of the egalitarianism, as discussed in "Some Rich People ARE Good" at https://www.pdrboston.org/some-rich-people-are-good . Q 2. Where has egalitarianism worked ON A LARGE SCALE before? It worked in Spain as discussed at http://newdemocracyworld.org/revolution/which.html and http://newdemocracyworld.org/revolution/spain.html and also in Brazil as discussed at http://newdemocracyworld.org/revolution/palmares.html . Q 3. Why is egalitarianism MUCH better than the class inequality we have today? https://www.pdrboston.org/why-egalitarianism-is-much-better . Q 4. What do most ordinary people think about the idea of no rich and no poor? Most (more than 80%) think it is a good (or a great!) idea, and you can see them saying so in this video (with NO CHERRY PICKING! ): https://www.youtube.com/watch?v=95b3SmBYwfU . When I went to a pro-Trump rally in 2016, 86% of the 50 random people I asked said they thought it would be a good (or great!) idea to "Remove the rich from power to have real, not fake, democracy, with no rich and no poor"; all of these people gladly accepted a button with this message that I offered to them and many of them pinned the button on themselves right on the spot. In fact, when I and others asked random people in public places in liberal Boston and conservative rural New Hampshire to sign this (https://docs.wixstatic.com/ugd/20615e_6c40d86078da6ea32d6379867405339e.pdf ) egalitarian revolutionary declaration of belief, 80% who read the declaration signed it, as discussed here: https://www.pdrboston.org/who-has-signed-this-i-believe . Q 5. Do we have to first persuade EVERYBODY to want no-rich-and-no poor before we can make society be that way? NO! That's as wrong as thinking that chattel slavery in the American South couldn't have been abolished until the slave-owners were persuaded to oppose it (which they never were!). Most people don't want our present-day class inequality, but our society is one of class inequality nonetheless because a mere minority (20% at most) want it that way. So certainly the vast majority who want society to be egalitarian and not class inequality can make it be that way. Q 6. How can a no-rich-and-no-poor society/economy actually work? In general outline: https://www.pdrboston.org/egalitarianism . In a bit more detail about what the motive is for working: http://newdemocracyworld.org/revolution/market.html . Some more detail about "rationing scarce things according to need": https://www.pdrboston.org/real-life-rationing . Q 8. How can it be genuinely democratic if there is no rich and no poor? Genuine democracy is achieved by voluntary federation as described in the short article linked here and in the articles to which it in turn links: https://www.pdrboston.org/genuine-democracy-what-is-it . There is an important common misunderstanding about democracy that is discussed here: http://newdemocracyworld.org/revolution/misunderstanding-democracy.html . Here are examples in real life today of voluntary federation on a national, continental and even a global scale: https://www.pdrboston.org/real-live-voluntary-federation . Q 9. Would people stop working hard enough to produce the things we want if there were no rich and no poor? No, and here's the evidence: http://newdemocracyworld.org/revolution/which.html. Q 10. What about freeloaders and slackers if there were no rich and no poor? They would NOT be coddled. https://www.pdrboston.org/what-about-freeloading-slackers . Q 11. Is egalitarianism (no rich and no poor) compatible with human nature? Yes, and here's the evidence: http://newdemocracyworld.org/culture/human_nature.html . Q 12. Does egalitarianism mean everybody is the same? NO!!! Here's why: https://www.pdrboston.org/what-equality-does-not-mean . Q 13. Is egalitarianism UTOPIA? NO! https://www.pdrboston.org/it-s-not-utopia . This means it is silly to say we can't have egalitarianism because utopia is unattainable. What if the 19th century Abolitionist (against slavery) Movement said, "We can't abolish slavery because utopia is unattainable?" Q 14. What would happen to the rich if we had no rich and no poor? https://www.pdrboston.org/what-happens-to-the-rich . Q 15. How much freedom is there in an egalitarian society? Much more than today. Here's why: https://www.pdrboston.org/freedom-egalitarianism . Q 20. Is egalitarianism really just Communism? NO! It's FUNDAMENTALLY DIFFERENT and here is why: http://newdemocracyworld.org/revolution/socialism.html . Is it really just socialism? No! And here is why: https://www.pdrboston.org/open-letter-to-socialists . Q 24. How can we remove the rich (with their 82nd Airborn Division, etc.) from power to have an egalitarian society that the rich absolutely will not voluntarily allow? Here's how: https://www.pdrboston.org/how-we-can-remove-the-rich-from-power . Q 25. What about nonviolence versus violence? Here's what: I think about this question: https://www.pdrboston.org/non-violence-or-non-cruelty-1 . Q 28. Why not aim for something much easier to achieve than no-rich-and-no-poor, such as just having a bit less extremes of wealth? Anything short of no-rich-and-no-poor, i.e., some rich and some relatively poor in a society that remains based on buying and selling so that money is power and some have more of it than others, will INEVITABLY develop increasingly greater and oppressive class inequality and end up being essentially the Goldman Sachs kind of world we have today. This is discussed here: http://newdemocracyworld.org/revolution/mom_and_pop.html . Here are other reasons for aiming for egalitarianism: https://www.pdrboston.org/why-be-openly-revolutionary (and also the reasons givin in the articles this links to under its title). Q 29. How come progressive organizations don't advocate egalitarian revolution, if it's such a good and important goal? The reason is that progressive organizations are in the business of keeping people busy NOT building an explicitly egalitarian revolutionary movement, and they do this for two reasons. 1) They are funded by Big Money, often indirectly so it is not obvious to anybody except the leaders at the top who know that if they advocated removing the rich from power to have no rich and no poor they would lose the organization's rent and salary money). 2) The rank-and-file, who do in fact want an egalitarian revolution, have been persuaded by Big Money's mass (and alternative) media to believe a Big Lie, that the general public is opposed to this goal and would support their organization less if they advocated it. I discuss this in great detail (about specific progressive organizations from small ones in my local neighborhood of Boston to the big national ones) in my article here: http://newdemocracyworld.org/culture/fund.html .